For years UAG has been my go to case recommendation. They provide a ton of protection while not adding a lot of bulk and have a great tactical look that’s popular with many. 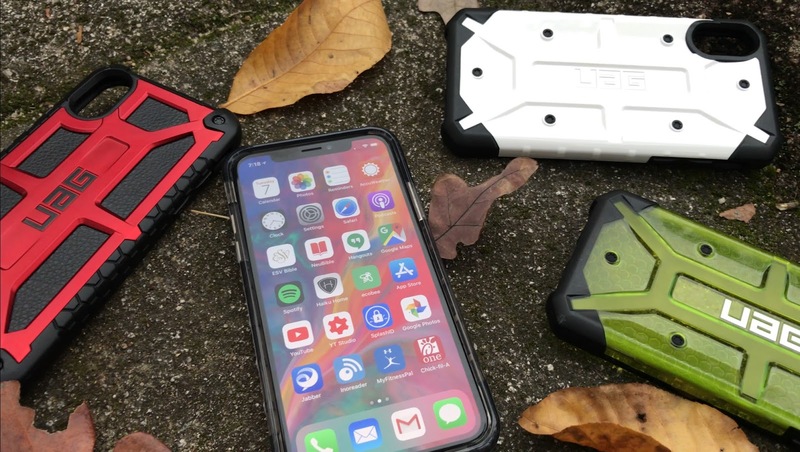 UAG was kind enough to send me these cases for review and in this review we’ll look at the four most popular models to help you decide if it’s the right case to protect your iPhone X.
We’ll dive into the specifics of each case that make them unique in a moment but first let’s look at the UAG defining characteristics that all these cases share. UAG cases are mil spec rated meaning they can withstand repeated drops from four feet to all sides of the case. This is largely due to the corner skid pads. The corners of the cases are bulked up to absorb impact without making the entire case bulky. Statistically if you drop your phone it’s going to hit a corner first and these corner skid pads do a great job of transferring that energy through the case and not into your phone. In addition to the skid pads the cases all feature a raised front edge to protect the screen without interfering with the edge swipe gestures. One of my favorite features that can get overlooked is how well the buttons work. Many cases make the buttons on your phone feel stiff or squishy. That’s not so with UAG. The buttons feature a slit alongside them that makes them work almost as well as if you didn’t have a case. They still click very well and are a joy to use. The cutouts are all very precise and adequate. They feature extra material that fills the opening making it flush with the phone. This keeps out dust and debri and also looks much better. It’s this attention to detail that makes UAG such a high quality case. The cases are easy to remove by prying on the corners and really easy to snap back together as well. And they all allow Qi wireless charging, even the thicker, multilayer Monarch. Lastly, each model features some level of honeycomb protection to spread shock absorption. The location and amount varies and we’ll go over that in detail as we look at each case. Let’s get started with the original, most popular model. The Pathfinder. The Pathfinder features a solid color back currently available in black, white, and orange. Though I would expect to see more colors in time. This model is almost completely lined with soft rubber honeycomb making it one of my favorites. Traditionally the Pathfinder has had a matte finish but this generation seems more glossy than others. The raised portions of the case are still matte though and will help prevent the back of the case from showing scratches. Next up is the very similar Plasma model. These cases look almost identical to the Pathfinder but have translucent backs that showcase the iPhone while still providing some color and character. The case is almost completely lined with a honeycomb pattern that’s more for looks than for protection since it’s made from hard plastic. The fake torque screws are slightly raised on the inside of the case and is the main material that the back of the phone comes in contact with. The backs of these cases have always been more glossy and show scratches easily. However on this model the raised portion has a matte finish, like the Pathfinder, and it's held up really well in my useage thus far. Then there’s the Monarch. This case takes a lot of its design cues from the previous two while taking the materials and protection to a whole new level. It starts with a soft impact resistant interior followed by genuine top grain leather and real metal screws. UAG is still sticking to their guns that these screws count as a layer of protection and I’m still sticking to mine in saying that they don’t. The leather and screws are followed by a protective plastic shell. The case I received features this beautiful crimson red color. Lastly the case is wrapped in another layer of impact resistant soft rubber. This is where the honeycomb pattern resides on this case. All this results in superior protection with premium materials. a bit misleading and definitely tricked me on my iPhone 7 Monarch case review. I wrongly assumed that it meant it could repeatedly withstand drops from eight feet instead of four. However, what this really means is that instead of the normal 26 drops from four feet, the Monarch was dropped 52 times from four feet with no damage. It’s not nearly as impressive of a claim and is a bit misleading especially given that this case is so protective and could definitely protect your phone from an eight foot drop. All of those cases are what we know and expect from UAG, but this year they’ve released a new case known as the Plyo. This case is transparent like the Plasma but doesn’t have all the tactical looking torque screws and patterns. Instead it’s a soft touch, smooth case that really showcases the beauty of your iPhone X. The protective corner skid pads are still there and are lined with the honeycomb pattern. It comes in three colors: the ice version I have here, a darker Ash, and crimson. This case has more grip than the others, except for possibly the Monarch with its soft rubber sides. I personally prefer a slicker case for taking the phone out of my pocket but most people want extra assurance that they’re not going to drop their phone and this case provides that. Out of the four cases this is the one I’ve been using the most. I personally really like the tactical look that UAG has gone for on their other models. However, I’m glad to see them slightly deviate from that to open their product up to a wider audience. For those familiar with UAG these are the same cases that you know and love and you won’t be disappointed. They continue to make small improvements year over year that make these cases some of the best you can buy. And if you’re new to UAG, or don’t care for the tactical look, then give the Plyo model a shot. It offers Mil Spec protection while not looking like it. If you have any questions that I didn’t cover feel free to leave those in the comments and I’ll get back to you.